Rockingham Ranch and Gelfenstein Farm’s X Y Jet broke running and never looked back, cruising to an easy 2 ¼-length victory in Saturday’s $250,000 Smile Sprint (G3) at Gulfstream Park. The six-furlong Smile Sprint for 3-year-olds and up anchored five stakes, two graded, worth $725,000 in purses on a spectacular 14-race Summit of Speed program highlighted by Stormy Embrace’s 15-1 upset victory in the $250,000 Princess Rooney (G2) – a ‘Win and You’re In’ event for the Breeders’ Cup Filly & Mare Sprint (G1). Also on the card were a trio of $75,000 stakes – the Carry Back for 3-year-olds and Azalea for 3-year-old fillies, both seven furlongs on the dirt, and the 5 ½-furlong Bob Umphrey Turf Sprint for 3-year-olds and up. Favored at 3-5 in a field of eight, X Y Jet ($3.80) hit the wire in 1:09.61 over a fast main track under regular rider Emisael Jaramillo to earn his 10th career victory, seventh stakes win and fourth against graded-stakes competition. Trainer Jorge Navarro was visibly emotional in the winner’s circle following the race, the first for X Y Jet since being beaten a head in the $2 million Dubai Golden Shaheen (G1) March 31 in Dubai, a year after losing by a neck in the same race. “Every time he runs he does that to me. He’s had three surgeries, what he’s done, what he’s accomplished, people still count him out,” Navarro said. “What does he have to accomplish for people to see that he’s the real deal? He might not be the top sprinter, but he’s the real deal. He shows up every time. X Y Jet, a gelded 6-year-old son of Kantharos, was sharp out of the gate from the far outside post, going straight to the lead tracked by the tandem of Grade 3 winner Classic Rock, Reason to Soar and Mo Cash though an opening-quarter mile in 22.16 seconds. X Y Jet began to separate from his rivals before hitting the half-mile mark in 44.36 and steadily edged clear through the stretch after straightening for home. Reason to Soar finished second, 2 ¼ lengths ahead of late-running 90-1 long shot Sweetontheladies, but was disqualified to fifth for bearing out leaving the far turn and bothering fifth-place finisher Splash Rules. Moving to third was Petrov, followed by Splash Rules, Reason to Soar, Mo Cash, Classic Rock and Grade 3 winner Mr. Jordan, who was unable to recover from a poor start. It was the eighth victory for Jaramillo with X Y Jet, including previous scores in the 2015 and 2017 Mr. Prospector (G3) and 2016 Gulfstream Park Sprint (G3). 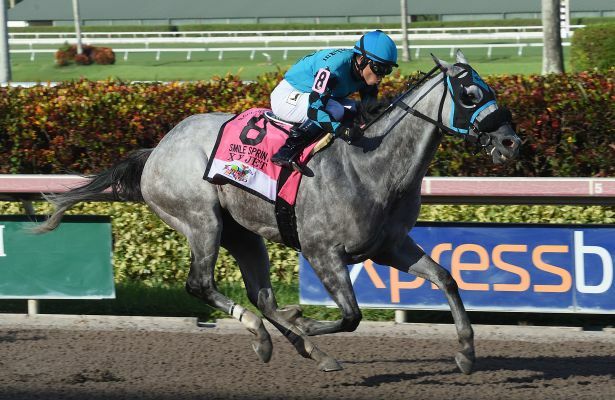 Overall, X Y Jet is six-for-11 at Gulfstream, with four seconds and a third. Navarro plans to give X Y Jet a single prep before the $2 million Breeders’ Cup Sprint (G1) Nov. 3 at Churchill Downs, possibly in the Frank J. De Francis Memorial Dash (G3) in the fall at Laurel Park.